There are many reasons to consider installing a pocket door, but the primary benefit is to maximize the use of small spaces. Planning ahead of time will help you finish this project easily. Pocket doors can either be a single door or double door set up. Much of the decision on which to choose rides on the type of function you'll need, the look you want and, if installing into existing construction, what's already behind the wall. The most important thing is to realize what the pocket door may be sharing with the standing wall. It's possible that the wall on either side of the framing as well as above the door will enclose electrical lines, air ducts, and plumbing. With new construction or larger remodeling projects, this may not be an issue, as you can flush this out ahead of time on your own or with the help of a remodeling contractor. But with an existing wall, don't swing a single sledgehammer before determining if these elements exist and if they can be relocated. Once that's complete, you will need to do some deconstruction prior to installing a pocket door to adjust the door frame and jamb. You'll also need whatever wall material you're using, such as drywall or paneling, and the paint or stain you'll use to finish the wall. Frame the entry. This will be double the size of the door for a single pocket door, because you are essentially creating a space for when the door is in position as well as retracted. A door that is 32 inches needs an opening 65 inches wide. Also align the header above and set it to a height of approximately 85 inches, which is standard. Modify these measurements based on your door's specifications. Make certain the header is plumb. This is where the track attaches, and it needs to be exactly level in order for the door to glide properly. Install the hardware. Start with the track, followed by the side-split jambs that guide the door, and the bumper stop within the pocket. Finish the door. This includes whatever paint or stain you might use, as well as the decorative hardware. 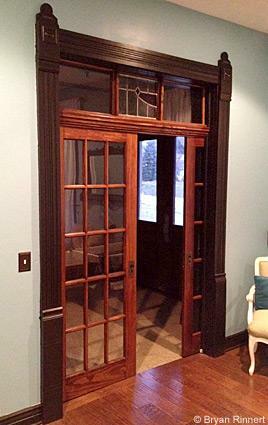 If not already completed at the factory, solid wooden doors and wood trim must be sealed with polyurethane to prevent warping. This will ensure your door slides well and fits neatly into the pocket for years to come. Attach the door. For the most part, almost any type of interior door of standard width and length can be used if you buy a jamb kit. There are also specialty door kits that include all components. Finish the wall surround. Construction adhesive is a handy tool as you attach drywall or other wall coverings, because it won't mar the pocket doors like nails or screws will. Install the guides and final jambs. Again, follow the hardware instructions for the best methods of installation. Attach the final molding. Whether you're using the casing from the door kit or your own molding, this will make the job complete. As with the doors, it's easier to finish these pieces before attaching. Watch a video on pocket door installation on Bob Villa's Home Again website. Don't want to cut into the wall? Mount an open pocket door.